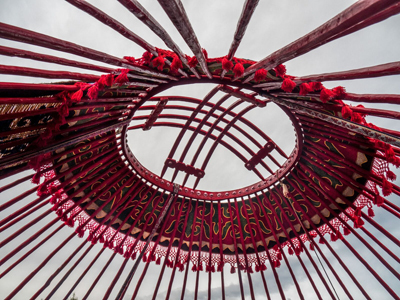 A tunduk - the element of a Kyrgyz yurt, through which you can see the sky. Uzbek Journeys offers a special glimpse into this beautiful and little known country. 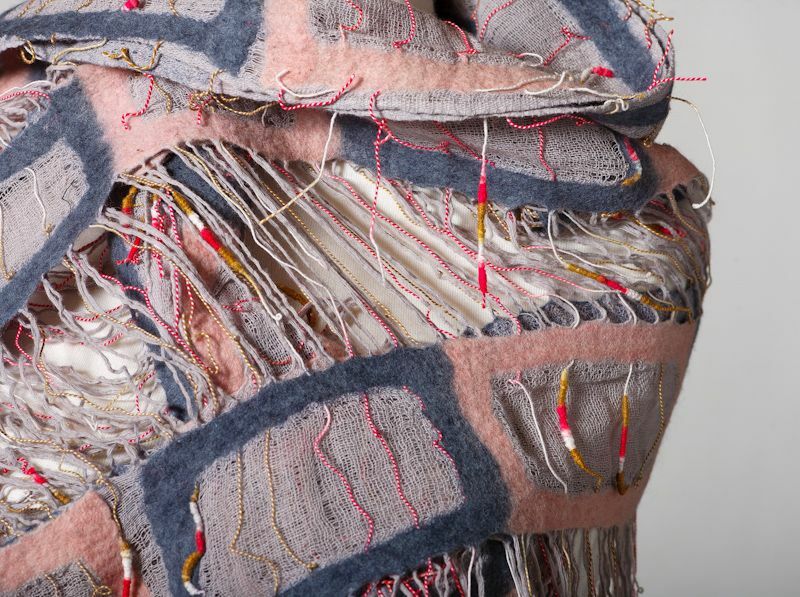 These tours combine the majestic, rugged landscapes of snow-capped mountains and lush valleys with visits to textile co-operatives, design workshops and yurt makers. The tours also include eagle hunting demonstrations, a buzkashi match and a visit to Karakol's livestock market. Kyrgyzstan is a small, Central Asian republic, almost entirely mountainous, lying within the Tian Shan mountain range. About 85% of the land is over 1500 metres above sea level. The climate is therefore cooler than Uzbekistan. 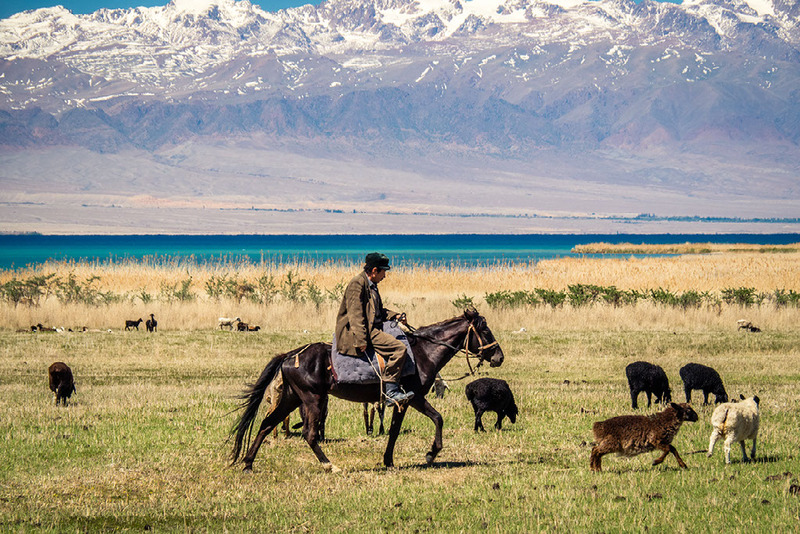 The Kyrgyz were traditionally nomads, travelling each year with their herds of cattle, sheep and horses from high mountain pastures to the lowland winter pastures. 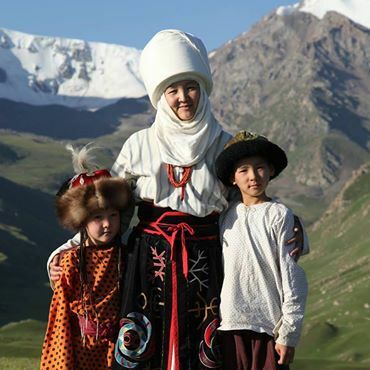 Today, Kyrgyz people take immense pride in their heritage and traditions. You stay in small, boutique hotels and guesthouses. Of course you have private bathroom facilities, except in Tamga. There is a maximum of 10 passengers per tour. The tours start and finish in Bishkek. It is a beautiful country, often called the Switzerland of Central Asia, and makes a marvellous contrast to the landscapes of Uzbekistan. If you are curious about travelling here, review 5 Reasons to Visit Kyrgyzstan written by food/travel writer Anita Breland, who travelled there with Uzbek Journeys. You can also read the articles posted on this website about Kyrgyzstan. Not all Kyrgyzstan-bound clients book an Uzbekistan tour. Some clients combine a Kyrgyz tour with travel to Turkey (as there are daily flights to/from Istanbul) or travel to Russia (flights from St. Petersburg and Moscow) or western China (flights from Urumchi). If you plan to join an Uzbek and a Kyrgyz tour in 2019, please refer to the section below on flights. Tour #1: 23 May - 30 May (8 days/7 nights) Tour #1 will be led by the excellent Kyrgyz guide and Penelope Price will accompany the tour. Status update 22 August 2018: This tour is fully booked. Please contact Uzbek Journeys if you wish to be on the waiting list. Tour #2: 5 - 12 September (8 days/7 nights) Tour #2 will be led by the excellent Kyrgyz guide and Penelope Price will accompany the tour. Both tours follow the same itinerary. The tour dates are based on the current flight schedule between Tashkent and Bishkek. However, it is possible to fly to Bishkek from other destinations. Please refer to the section below about flights to Kyrgyzstan. Please do not book your flights to Bishkek until the schedule of flights from Tashkent>Bishkek>Tashkent is confirmed. Note: For travellers who join both the Kyrgyz and Uzbek tours in September 2019, there is a 4-night gap in Uzbekistan between tours at your own expense. Uzbek Airways usually publishes its schedule in January, so there may be less time in Tashkent if the schedule changes. Tashkent is a most interesting city to spend time in, especially over the weekend. Please read the posts 48 Hours in Tashkent and Another 48 Hours in Tashkent. Both articles provide Tashkent options not included in the Uzbek Journeys tour. They also link to many other posts about what to see and do in Tashkent. In September the theatre, opera and ballet season opens again. The weather is good and the harvest fruits and vegetables are plentiful. Or you may consider visiting the Ferghana valley or the ancient Buddhist centre of Termez. Because flights often arrive early morning into Bishkek, many clients prefer to arrive earlier than Day 1 and relax before the tour starts. Uzbek Journeys can book accommodation and transfers for you. After breakfast visit Aidai Asangulova's workshop. Aidai was born and raised on the southern shore of the Issyk Kul lake region in a family of yurt makers. Felt making has always been part of her life, and later, while working as an artist in Bishkek, she developed a unique technique that fuses felt and silk in her creations. Her fabulous work is sold internationally. Later visit the studio of renown doll maker Erkenbu eje. Following lunch, there is a Bishkek sightseeing tour. This will include the Ala-Too square with the statue of Manas (the national hero) and the old square with Lenin’s statue. You will also visit Tumar Studio. 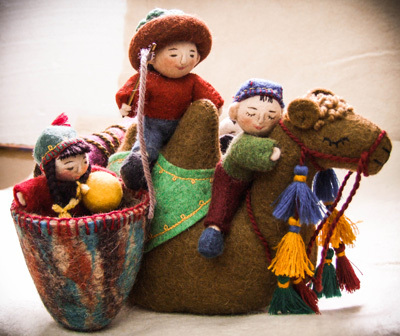 Tumar is a contemporary Kyrgyz design studio, which produces all manner of felted products from ethnographic horse trappings to simple, contemporary shoes, jewellery and accessories. 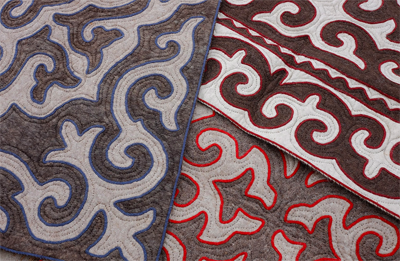 To create livelihoods after the Soviet disintegration in 1991, Tumar’s three co-founders sought to elevate the quality of Kyrgyz felt to its historic glory and at the same time incorporate contemporary design. The quality and innovation of the items here are outstanding. 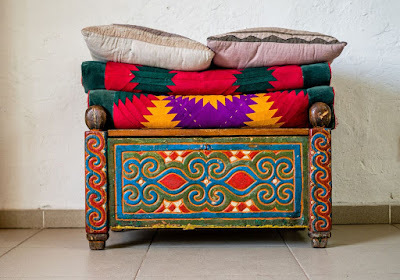 As well as felt, there are many quality items such as ceramics, jewellery, fashion and old embroideries. (Good news - Tumar accepts credit cards). Overnight Bishkek hotel. 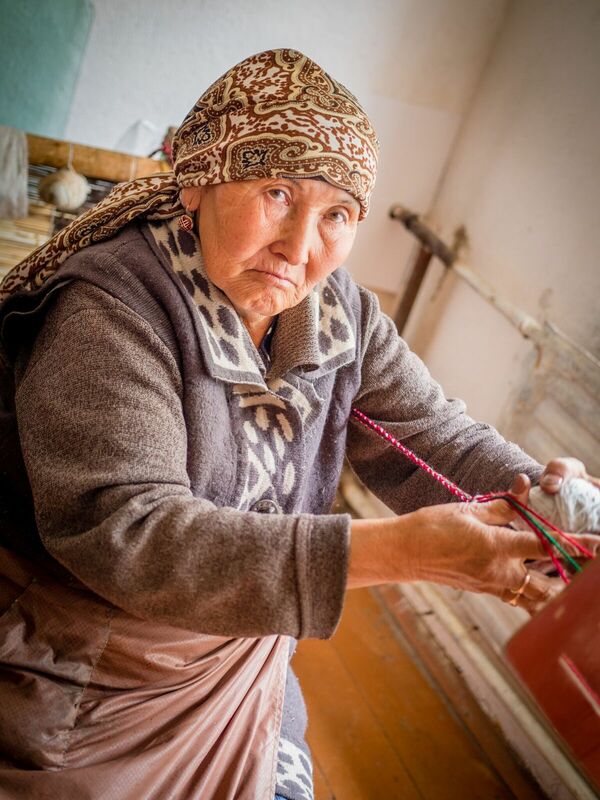 After breakfast, travel to Kochkor village, 260 kms from Bishkek, where you will visit a master feltmaker and her family to watch the process of felt carpet making. (Lunch includes possibly the most delicious jam in the world). Prior to reaching the hotel at Cholpon Ata, visit a fascinating open-air gallery sometimes known as the Stone Garden. 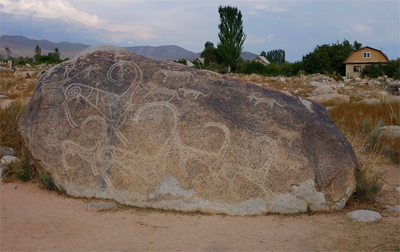 It covers 42 hectares and contains hundreds of petroglyphs, dating from 500 BC to 600 AD. 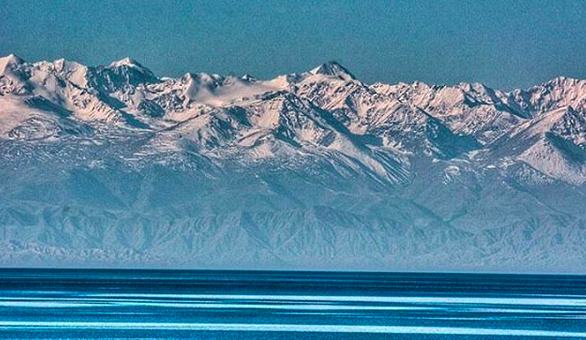 Although snow-capped peaks surround Issyk Kul lake, it never freezes. Hence its name, which means "hot lake" in Kyrgyz. Overnight in a hotel near the lake, where dinner will be served. Prior to reaching Karakol, you will visit the Przhevalsky museum, dedicated to this famous Russian geographer and explorer, and after whom the Mongolian wild horse was named. Later, transfer to Karakol, the fourth largest city in Kyrgyzstan, near the eastern tip of Issyk Kul lake, about 150 kilometres from the Kyrgyzstan-China border. After lunch, visit a very pretty wooden mosque built by Chinese artisans between 1907 and 1910 for the local Dungans, and an appealing wooden Russian Orthodox church, the Holy Trinity Cathedral. It was completed in 1895 and used as an officers’ club during Soviet times; it is now restored and in use again as a church. There is also a small section of Russian colonial "gingerbread" style residential buildings. In the evening will be a Kyrgyz folkloric dinner show with Kyrgyz national music and songs. Hopefully a manaschi - a Kyrgyz bard, who recites verses from the epic poem Manas, the centrepiece of Kyrgyz literature, will also participate. Overnight in a delightful guest house. Early morning, before breakfast, drive to Karakol’s famous weekly livestock market. Later explore the Ayu Tor gorge. Transport to reach this valley is by Russian military mountain truck. Possibility to swim in a Soviet era thermal spa. After a picnic lunch, there's an optional easy hike before returning to Karakol. In the morning drive to Jety Oguz gorge (40 minutes), a lush valley with striking red sandstone rock formations – the ‘Seven Bulls’ from which the valley takes its name. 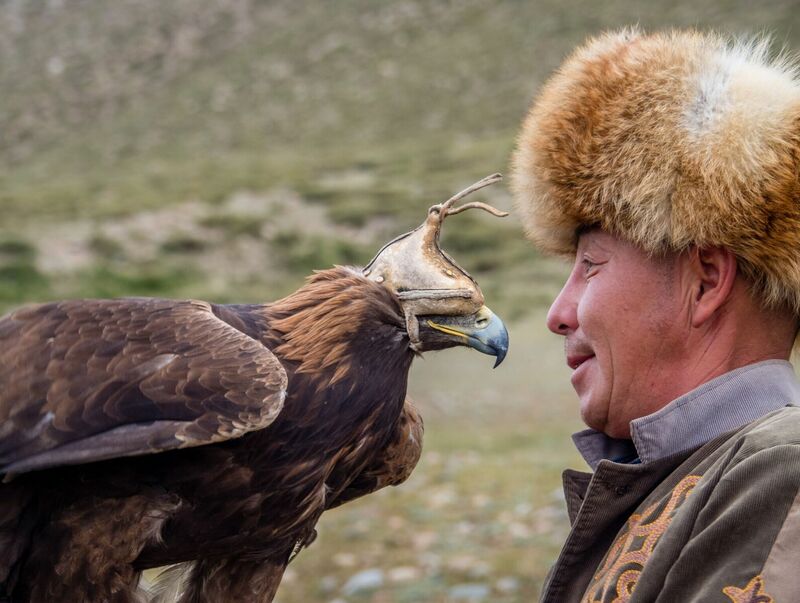 Here you will watch an Eagle Hunting show. Then free time for a little hiking, followed by a picnic lunch. Transfer to Tamga, about 90 minutes from the gorge. 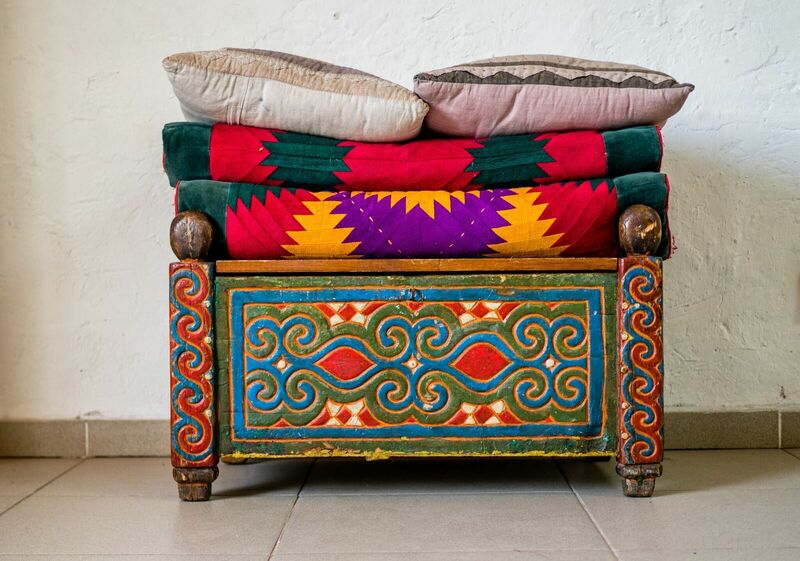 Before reaching Tamga, visit famous yurt maker Mekenbek’s house in Barskoon village. Overnight in a private guest house - shared facilities. En route to Chon-Kemin stop at Kyzyl Tuu village, on the south shore of Issyk Kul lake. This is the village where Aidai, whose Bishkek workshop was visited on Day 1, was born. Here you will have a very tasty lunch in a local home. Continue driving to the beautiful Chon-Kemin valley. You will have the opportunity to visit an old Soviet farm (kolkhoz) village and enjoy a short hike in the valley with green fir trees on the mountain sides. Overnight in a lovely guesthouse. After breakfast start driving to Bishkek. En route you will visit the Burana Tower. The tower, along with grave markers, some earthworks and the remnants of a castle and three mausoleums, is all that remains of the ancient city of Balasagun which was established by the Karakhanids at the end of the 9th century. The next stop is in nearby Don-Aryk village where you will witness the famous horseback game called ulak-tartysh (also known as kupkari and buzkashi). After the game, around midday, lunch at the local house of Mukan Baike in Don-Aryk village. Continue to Bishkek, 70 kms away. Based on 2018 schedules, the flight from Bishkek to Tashkent departs at 1810. Breakfast is included, though you will need to check out prior to 12:00 noon. Tashkent-bound passengers have the airport transfer included. If you are staying longer in Kyrgyzstan, accommodation and transfers can be arranged. The tour costs below are based on a minimum of 5 people per tour. If there are fewer, the price will increase and the vehicle will differ. The maximum number of passengers is 10 persons. Kyrgyz tours include all meals and activities. Tour pricing: Because of the volatility of the Australian dollar, tour prices are now quoted in US dollars. Please note that Australian dollars are not convertible in Central Asia - Uzbek Journeys can only pay partner travel agencies in US dollars. Although tour costs are quoted in US dollars, payments can only be made in Australian dollars to Uzbek Journeys. It is not possible for Uzbek Journeys to accept payments in US dollars. Please read carefully the section on tours costs in the Terms and Conditions. Accommodation in twin share rooms with private bathroom facilities (except Tamga shared bathrooms) in Kyrgyzstan. Visa fee if required. (Effective 1 August 2012, the Kyrgyz parliament passed legislation allowing visa-free stays of up to 60 days for many nationalities, including Australia, USA, New Zealand and most EU passport holders. View the list). Transfers to/from Bishkek airport if arriving/departing on airlines other than Uzbek Airways on days 1 and 8. Travel insurance: comprehensive travel insurance, providing cover against personal accident, death, medical expenses and emergency repatriation is a condition of participating in this tour. It is strongly recommended that it also cover cancellation, travel interruption, personal liability and baggage loss. And, you should also consider that it is not possible for Penelope Price, operator of Uzbek Journeys, to obtain Public Risk cover for risks outside Australia. Therefore it is not possible for you to rely on any such cover. Please arrange this with your flight booking agent or insurance broker. Details of your insurance cover must be provided at the time of final payment. Not many airlines fly to Bishkek - it is part of the allure of this remote and beautiful country. Uzbek Airways flies twice weekly from Tashkent and there are daily flights from Moscow, Dubai and Istanbul. Some clients, who wish only to join a Kyrgyz tour and not combine it with an Uzbek tour, often have a Russian or Turkish holiday first. There are also flights from Ulaanbaatar (Mongolia), New Delhi, Urumqi (China), Kazakhstan and Russia. Passengers who wish to join both an Uzbek and a Kyrgyz tour, can take advantage of Turkish Airlines extensive Central Asian network from Istanbul. e.g. fly one-way into Bishkek, join a Kyrgyz tour, fly to Tashkent, join an Uzbek tour and then fly home (or onward) from Tashkent. Or this can be done in reverse. Alternatively, you can fly into Tashkent and then fly on Uzbek Airways to/from Bishkek. (Uzbek Airways currently operates twice a week, on Wednesdays and Thursdays. If you do this, then a double entry visa for Uzbekistan will be required. Please discuss flights with your travel agent. Uzbek Journeys does not book flights. It is your responsibility to advise Uzbek Journeys of any pre-existing medical conditions and/or disabilities that might reasonably be expected to increase the risk of you requiring medical attention, or that might affect the normal conduct of a tour and the enjoyment of other tour members. Kyrgyzstan is a mountainous country and you gradually drive over passes as high as 2,350 metres by minibus. However, you do not spend time at those altitudes. There are also gentle hiking opportunities on this tour: passengers should be fit and have solid footwear if you elect to hike. Hiking is optional. There are no lifts in the hotels where you stay, and sometimes staircases are narrow and steep. Hotel staff are available to assist with baggage - and a small tip would be appreciated. Any person 75 or over at the time of travel is required to provide a Fitness to Travel certificate from his/her doctor at the time of making a booking and again just prior to final payment. Please also review the FAQ section on health. The tours are scheduled to coincide with usually good seasons, May/June being a little milder than the peak September season. The GIS website provides reliable Kyrgyz forecasts. Foreign exchange is handled through banks and authorised currency exchange offices. Like most of Central Asia, Kyrgyzstan is largely a cash economy. Bring US dollars: only fresh, undamaged bank notes will be accepted for exchange. Notes less than US$50 will attract a lower rate than higher denominations. Very few establishments accept credit cards and travellers' cheques. There are ATM machines in the larger cities, and none in rural areas. The Terms and Conditions for these Kyrgyzstan tours are outlined in the general Terms and Conditions section. Note, however, that the maximum number of passengers is 10 persons. By booking a trip with Uzbek Journeys (ABN: 72818242110 , Travel Agents Licence 2TA0882) you are deemed to have agreed to those Terms and Booking Conditions and, provided there is availability, your booking will be accepted on this basis. Please review carefully the terms and conditions. Then contact me to check the availability of the tour. If available, I will forward you a pdf file containing the terms and conditions, booking form and participant declaration. The Kyrgyzstan tour is a separate tour and therefore requires a separate deposit etc. A strictly non-refundable, non-transferable deposit of A$600 per person will secure your spot. Your deposit will be converted into US$ based on the A$-US$ Westpac bank telegraphic transfer rate of the date when the funds are deposited. You will then be advised of the US dollars balance. Credit cards/Paypal are not accepted. Uzbek Journeys is an online travel agency only. There is no facility to accept bookings from participants who do not have regular internet access. All documentation and updates are sent and received electronically. I look forward to introducing you to the beauty of the Kyrgyz landscapes, craft and traditions.